Banff/Lake Louise, in the heart of the Canadian Rockies, must rank among the best places to find pint-sized adventures. Just standing around and looking at the unmatchable scenery is enough to provide superb non-ski entertainment. On a recent visit, where I teamed up Mark and Paul, a ten and a thirteen year-old from New Zealand, we spent a lot of time at the "Mountain Rapids" Waterslides at the Douglas Fir Resort (www.douglasfir.com; 800-661-9267). We were lodging there, so it was easy to hop from the condo to the water, but the place is open to the public. The two slides are actually quite intricate for an indoor facility; they spiral around themselves several times before dunking you out in the base pool. It kept the kids entertained for quite a while and the joint was jumping with kids from toddlers to teens. Almost everyone gets a kick out of dog sledding. There's something amusing and loveable about watching Huskies pull - they enjoy it so much. At Howling Dog Sled Tours (www.howlingdogtours.com; 877-DOG-SLED) you can do two-hour tours, lunch tours or apres-ski/dinner tours. Snowy Owl Sled Dog Tours (www.snowyowltours.com; 888-311-6874) offers two-hour, eight-hour and even overnight tours, as well as tours of their kennels. Unlike many U.S.-based outfits, up in Canada they even let you drive. Back of Beyond Adventure Company (www.backofbeyond.ab.ca; 800-732-7251) has an award-winning summer family backpacking program. In winter, they offer half-day, full-day and multi-day backcountry cross-country skiing and snowshoeing. Tracked and off-piste routes are available, and so are moonlight ski or snowshoe tours and ice-canyon explorations. Speaking of ice-canyon tours, that's a specialty of Discover Banff Tours (www.banmfftours.com; 877-565-9372). They operate a selection of 3.5-hour explorations that travel over suspended catwalks across the canyons, or treks through the canyons themselves. Remarkable ice and rock formations are revealed, as well as pictographs and frozen waterfalls. Other ice-canyon tours are offered by White Mountain Adventures (www.canadiannatureguides.com; 403-678-4099). 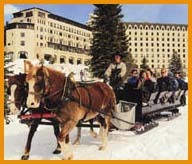 You'll seldom take a winter, horse-drawn sleigh ride in a more beautiful setting than outside the Chateau Lake Louise. Brewster Adventures (www.brewsteradventures.com; 800-691-5085) follows the waterside trail to the end of Lake Louise during the day or evening, revealing views of the Chateau and spectacular, natural mountain scenery. The Chateau and the lake are worth a visit even for those who aren't sleigh riding or lodging there. Ice skating goes on all the time and, from mid-January til the snow melts, fantastic ice sculptures are on display, along with an ice castle. Just walking across the snow-covered, frozen lake makes a mini-adventure. Ice skating can also be done at the Banff Springs Hotel and, in town, at the Banff Recreation Centre (403-762-1238). Another kind of sliding - tobogganing - can be done at the Chateau, the Banff Springs Hotel, Riverside Park or in nearby Canmore at so-called Cemetery Hill. A number of shops rent toboggans. For an unfrozen adventure, visit the Banff Upper Hot Springs (www.parkscanada.gc.ca/hotsprings; 403-762-1515) where you can loll about in the hot mineral water. Canada's National Park system began in 1885 at what is now the Cave and Basin National Historic Site (403-762-1566). Here you can see a warm mineral springs inside the cave and, outside, an emerald-colored basin. You'll also find: interpretive trails in which live warm water fish and garter snakes; warm mineral pools with unique plants; exhibits on the creation and evolution of Canada's national parks; and a video entitled "Steam, Schemes and National Dreams". Self-guiding interpretive boardwalk trails reveal the history of the hot springs and information on the flora and fauna. Looking for some indoor stuff to do? The Banff Centre (www.banffcentre.ca; 403-762-6100) has an indoor climbing wall for all ages and ability levels. Equipment rentals and comprehensive instruction programs and camps for adults and children are offered. The Centre also has a pool, fitness center and squash and badminton courts.